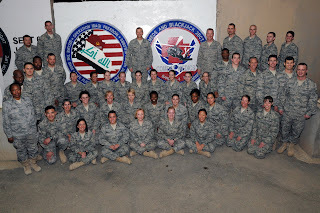 I have been extremely fortunate to work with a lot of great people on this trip in the EMEDS unit, some of whom I will likely keep in touch for a lifetime. Here is are our final squadron pictures in front of the TWall art that Charlotte Shealey (IM Doc) and Karen Doherty (Dentist) designed and painted. 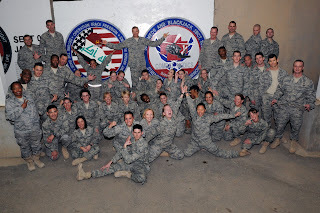 I am currently awaiting the arrival of my replacements that, through the infinite wisdom of the US Air Force, are 2 days late and stranded in Balad. That leaves us stuck here and, since we have missed our scheduled flight, at the mercy of a completely incompetent system of air transport. I'm sure that things will work out in the end, though - this deployment just has to continue harassing us as long as it possibly can :). Since arriving at the KRAB, I've been making plans to do a marathon here. My initial thought was to do it in the heat of the summer for no good reason beyond "just because." 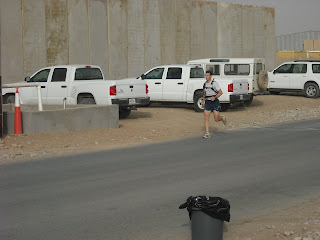 If you've read my Birthday Blog entry, though, you know that I ran my first marathon here on 9/9/9. While I was training for that effort, though, I encountered a fair number of other people (mostly in our EMEDs unit and running club) that were interested in running a formal marathon with me, so we started working out the logistics of this kind of a race. The services section was willing to help us put on the run, so we got it scheduled as a marathon as well as a 1/2 marathon on the first weekend of November. We got help from one of Greg's friends to design a pretty cool T-shirt and advertised the race, hoping that people would take the few months that were left to get themselves ready. After the long preparation, race-day finally arrived! It was a beautiful day, cool and clear without any wind. 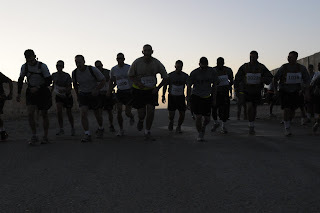 Here is a picture of us starting the marathon (at 0615). I felt really good on the first couple of laps (each lap 6.55 miles), despite the fact that I was about 2 minutes behind the leader. I decided to run my race and keep my pace just under 8 minutes per mile and if he was able to stay ahead of that, more power to him, but I wasn't going to wear myself out to catch him. As it turns out, he thought the race was only 2 laps and was so demoralized when he finished the 2nd and found out he was only 1/2 way done, that he slowed down to a crawl and I passed him less than a mile later. I kept up the same sub 8 pace for the third lap and here is me coming across the line to start my 4th lap. I felt really strong at this point - much better than I had during my previous marathon despite the fact that I hadn't taken a walk break yet. 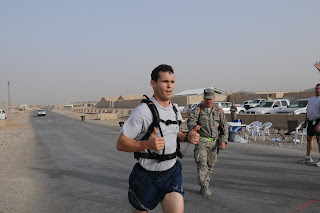 I continued at pretty much the same pace and finished the marathon at a time of 3:24:30, which I felt great about. It was a full 20 minutes faster than my last time and I felt much stronger this entire race as well. Here is a picture of my buddy Greg, who finished the 1/2 marathon in a time of 1:34:20. 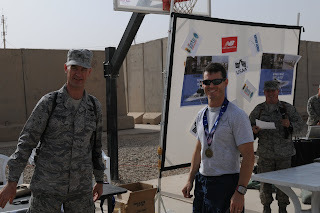 There were 2 of us (SMSgt Pehrson and I) from the EMEDs that ran the full, and 7 others (including Greg) who ran the 1/2 marathon. It was a great day for a run and we all had a lot of fun. It was also nice that the even that we planned so long ago to be shortly before the end of our tour was finally here! It almost felt like I was running home! As a kid I would see the firemen at the parades and wish that I could be up there driving the engine. Sometimes you have to go half-way around the world to get opportunities like that, but if y0u manage to make friends with the right people many things are possible. Greg worked an angle to get a fireman and his buddies a ride in a helicoptor and in appreciation they asked if we wanted to come drive their equipment. Here we are driving one of their aircraft emergency response vehicles, which they position on the runway to hose down any plane that comes in "hot." It has a water cannon on the front (connected to a joy-stick) that can target about 50 gallons a second that we played around with while we were driving. 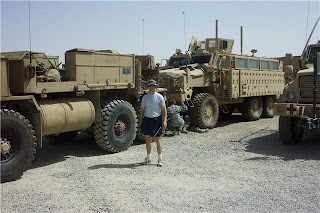 This vehicle handled much like those huge MRAP trucks did - big and heavy on the acceleration and turns. Here is a picture of us driving the classic fire engine, which was just like driving a big semi-rig. We had a great time and were happy for the diversion. Greg and I aren't the only folks on the base with more time on their hands than they know what to do with - not by a long shot! The group of people that take care of the Air Force Ammo are right along with us trying to figure out how to spend their "extra hours" during deployment. They looked around the area and took inventory of their assets - namely a lot of empty ground between ammo bunkers - and decided it would be a perfect place for a golf course. The course they set up is 9 holes, each hole between 60-90 yds in length and complete with "greens" of raked dirt and a drilled in cup for the flagged hole! Quite amazing what they did with the space! Greg and I managed to make a connection in this group for the express purpose of golfing on the course, which they are happy to share. Here we are practicing at the driving range. You can see the golf bags (missile launching tubes) only need 3 clubs: a 9 iron, a pitching wedge and a putter. We had a great time hitting around and made plans to schedule a round of golf on a weekly basis until we departed the theater. We scheduled a 1/2 marathon and ran it today in preparation for the full marathon in NOV. 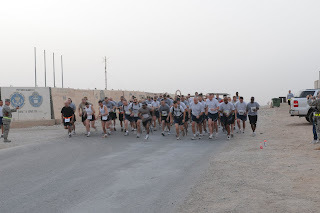 I was amazed at the number of runners- over 90 AF, Army and civilians participated. It was a beautiful day for a race, with the temperature about 75-80' at the starting time of 0600. 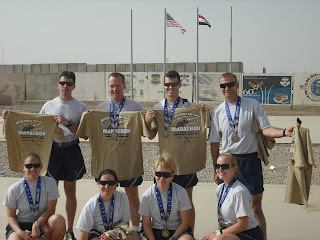 Our small EMEDs unit had 9 runners - here are some pictures of us getting ready (I'll add them later). There was a stiff breeze running with us during 1/2 of the loop and directly in our faces for the last 3 miles each revolution - made trying to kick it up a notch on the home stretch that much more difficult. I ran pretty strong and ended up finishing 4th overall (and third in my age group) with a time of 1 hr 38 min 04 sec. The COL finished 1st in his age bracket. 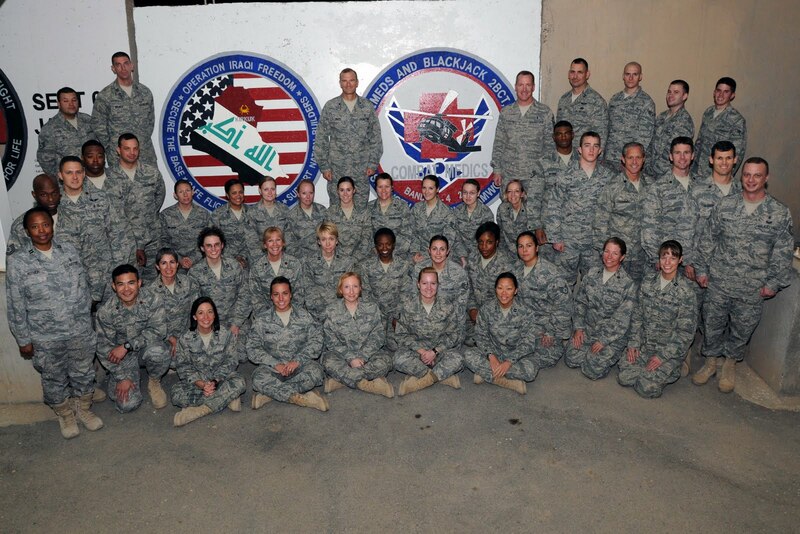 SMSgt Pehrson, SRA Kandi Knudsen, SSgt Sara Wise and Capt Emily Eschbaucher all medaled in their age group as well. 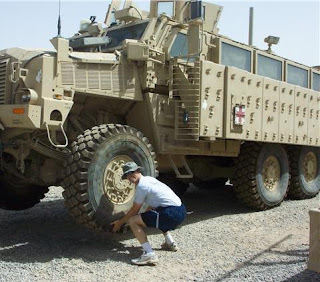 I have talked briefly before about the vehicles that the Army designed and now uses out here to help minimize the serious damage that has been inflicted on our troops by IEDs and roadside bombs. These vehicles are called MRAPs (Mine Resistant Ambush Protective) and they come in several different sizes and missions. The common theme is that they have a "V" shaped hull to dispell the force of any explosion and are heavily armored to protect from direct fire as well. 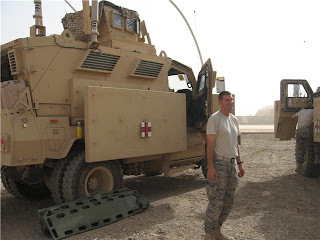 Here is a picture of me showing off my newfound strength, that has come from working out every day while I'm deployed, by lifting up the front end of this MRAP. Actually it was pretty impressive to see a tow-truck big enough to lift and tow one of these 30 ton (I've been told that's about what they weigh) behemoths. I jumped in to get the above picture when he had the front end up off the ground. 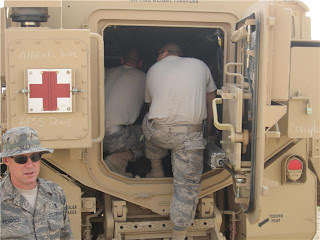 Below you can see one of the smaller models that we use as an ambulance in hostile territory (Capt Joey Bruner - Bioenvironmental guy from Kirtland AFB - seen in front). As big as they are, with all of the armor on the shell, the interior of these things is pretty cramped. 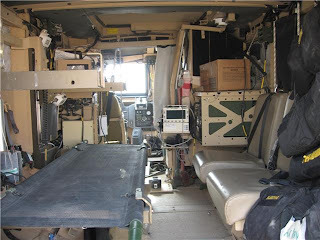 They can design them with seats for troop transport, with electronic equipment for other missions or with space for stretchers (as seen below) to care for the wounded. If the interior is cramped, though, it is nothing compared to the "hatch" at the rear that is used to get in and out of these things. Usually that isn't a problem (with healthy soldiers going in and out), but it does make off-loading patients on stretchers a bit sporty. As you've probably noticed from previous posts - Greg and I tend to meet a lot of people, many of whom are very willing to allow us entertaining diversions from the everyday life here at KRAB. When we first got here we decided that we "needed" to find someone to help us get behind the wheel and drive one of these things. We got our opportunity recently and really enjoyed the experience. These are pictures that Greg took while I was driving. Try to imagine driving a combination of a semi-truck and a monster truck - then put it on steroids and give it armor and a turret gun! That's about what you have when you are behind the wheel of an MRAP. Despite the weight and distribution of the armor (which makes it a bit top-heavy), it actually handles pretty well. Probably not great on gas mileage, though! I managed to get myself a recognition award (not by doing something "heroic in wartime" or anything like that - I answered a question correctly in a briefing) that allowed me to choose an incentive award from among a list of "cool things" that I wouldn't otherwise get to do. Among them were things like going on a helicoptor ride over the base, shooting a sniper rifle or playing combat golf. 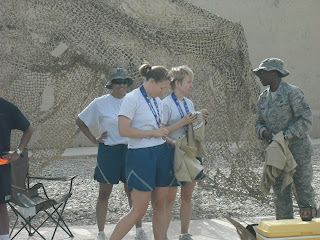 I chose to go out to the EOD (Explosive Ordinace Destruction) team compound and shoot the laser that they use to blow up roadside bombs and mines when the are able to identify them. This MRAP is designed with the electronics inside to control the laser that is mounted in the rear. Here is us looking down the range at the targets. This thing is so powerful that they can melt designs into the concrete barriers around the base. Here is the plaque that Col Overturf (base commander) had made from my target board.